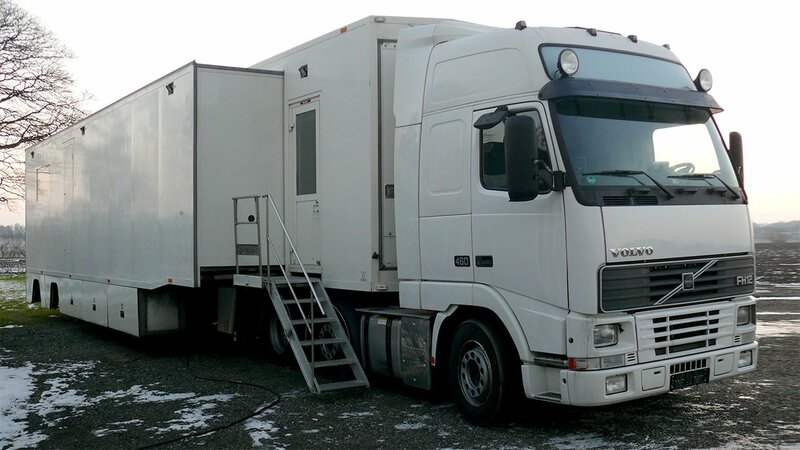 A highly capable 14-camera HD OB truck, the vehicle itself is in excellent condition throughout, having been refurbished only two years ago, while the equipment available means the truck requires only minimal modification to be operated. The production gallery is equipped with a Grass Valley Xten 4ME, 54-input vision mixer, along with 8x Sony 40″ monitors. EVS positions to the rear of the production gallery can accommodate three operators. Video routing is driven by a Grass Valley Venus 96×192 HD router, while an NTP 116×116 AES router covers audio requirements. A Grass Valley Jupiter SI 300C redundant controller is also installed. Harris Inscriber G3 graphics and Abekas DVEous/MX digital video effects are also installed. The engineering desk includes test and measurement equipment from DK Technologies and Tektronix, as well as Sony RCPs and master set-up unit. The audio suite features a Yamaha PM1D audio mixer with 64 mic/line inputs, 64 analogue outputs, 64 AES inputs and 64 AES outputs. Genelec 1032 and 1029 monitors are included, as well as a DK Audio MSD600M sound meter, TC Electronic level maximizers and Sonifex word clock distribution amplifier. There are also telephone and ISDN hybrids installed. Genelec audio monitoring and Drake 400 intercom positions, powered by a Drake 96×96 matrix, are included throughout the vehicle. Two eight-channel Avid Playmaker replay systems are available at an additional cost. See Optional Equipment Available, below. Available at additional cost. See Optional Equipment Available, below.